Co-sponsored with the AMVETS Ladies Auxiliary, this is a K-12 program offered through schools and youth programs to educate our youth on the meaning of being an American. We do this by providing a series of contests involving flag drawing, posters and essays that are age appropriate and grade specific. All national entries receive a Certificate of Participation signed by the National Commander. Gift cards are awarded to 1st, 2nd and 3rd place winners, with the 1st place winners also receiving a plaque. 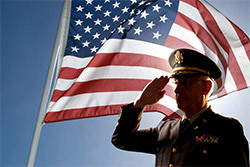 Since 1987, AMVETS National Service Foundation has provided a special recognition and unique four-day educational experience for the 9th grade National Americanism Essay Contest winners. They receive an all-expense paid trip to “Spirit of America” a four-day youth conference that is held annually at Freedoms Foundation, in Valley Forge, Pennsylvania. Freedoms Foundation at Valley Forge is a national, not-for-profit, non-partisan, non-sectarian, educational organization. 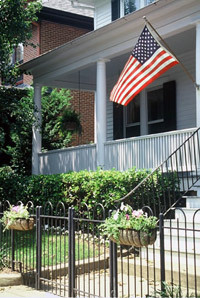 It exists to help preserve the ideals and principles upon which the United States was founded and to help Americans become better informed, responsible and active citizens in the social, political and economic life of our nation to prevent the erosion of those ideals and principles from our American culture.